Israeli President tells Chief Rabbi Gabriel Davidovich Israel will "do everything necessary to protect Jews' following anti-Semitic attack. 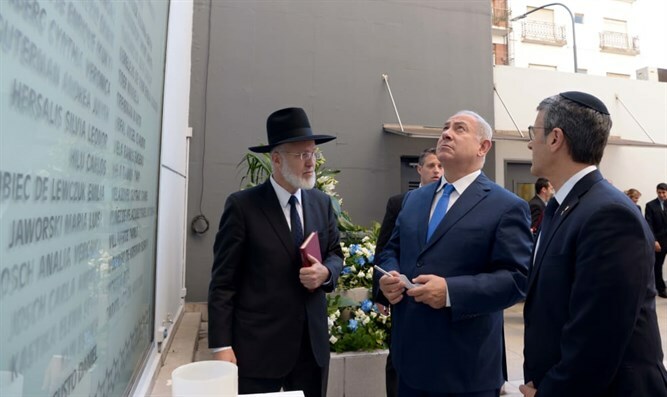 President Reuven Rivlin spoke today to Chief Rabbi Gabriel Davidovich of Argentina, who is in the hospital following a violent anti-Semitic attack at his home. Jewish Agency Chairman Yitzhak Herzog also spoke to Rabbi Davidovich. "His body suffers from severe pain and fractures, but his spirit is strong," Herzog said. "I understood from his words that the attack was completely anti-Semitic in nature. I wished him full recovery from all of us. The Jewish Agency will assist him and his community as much as necessary." "Five masked men entered the rabbi's apartment in Argentina, tied him and his wife and attacked them by force. All his ribs were broken and he lost consciousness. At first the story was hidden and received a report on a local site but now we are here. This is an exceptionally serious incident," Herzog added.